Makeup brushes are like the tools of the trade for those who love and practice makeup. Even if you use the most expensive makeup products, they are of no use if you do not have the right brushes. It is a common myth that quality makeup brushes are expensive. There are many good quality sets available in the market which are cheap and efficient. 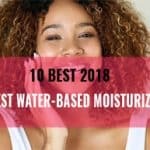 If you are looking for some good makeup brushes and sets which give a great finish and don’t burn a whole in your pocket, here are ten makeup brush sets which are popular for the finish they provide:. 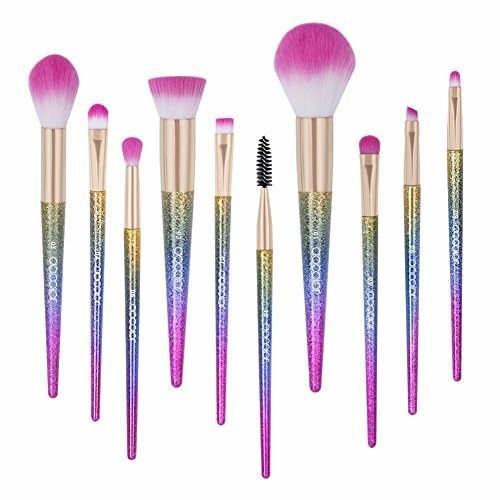 If you are looking for a complete face brush set, this rainbow-inspired set will make a pretty addition for your vanity. The brushes are vegan which means that the bristles are made up of super-soft synthetic fibres. The set comes in a beautiful rainbow box packaging which you can use to store them also. The set contains powder brush, foundation brush, concealer brush, eyebrow brush, highlighter brush, and three eye shadow brushes. The bristles feel very soft and luxurious on the skin and do not shed at all. At this price, this set is a complete steal. The colourful rainbow brushes make your makeup mornings even more pretty and colourful. The quality of the brushes is also very good when compared to the price. If you are looking for a cruelty-free makeup brush set with natural bamboo handles, this set from Matto is designed to take care of all your makeup needs. 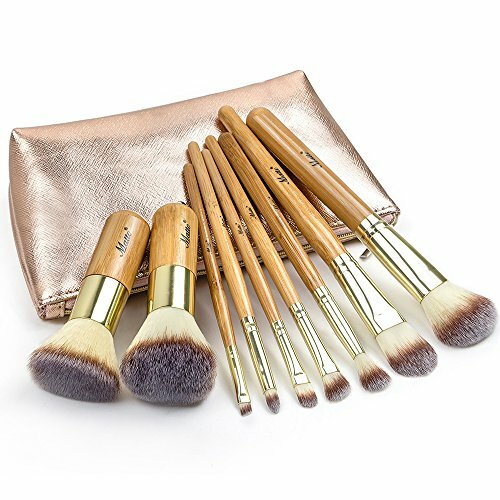 It comes in a gold travel bag which makes it easier to store these brushes when travelling. The non-porous synthetic bristles are very easy to clean after you are done using the brushes. The set contains 9 brushes which include a flat kabuki brush, powder brush, contour brush, foundation brush, eye shadow brush, highlighter brush, concealer brush, blending brush and eyebrow brush. The quality of these brushes with their natural bamboo handles and cruelty-free nature makes this set a perfect addition to your brush collection. The price is very cheap when it is compared with the quality of bristles this set has. At 10 dollars, this 30-piece brush set is like a dream come true for makeup lovers who want good-quality makeup brushes within budget. This set comes in a functional pink case. The set contains one sector brush, three face brushes for bronzer, compact, and blush, one foundation brush, thirteen eye shadow brushes for creating different eye looks, one nose shadow brush, five lip brushes, one eyeliner brush, one mascara brush, two eyebrow brushes, one eyebrow comb, and one sponge eye shadow brush. People who love creating different eye makeup looks will love this set as it has an exhaustive range of eye makeup brushes. The quality of the brushes is also very good. This pretty flower-patterned brush case from Unimeix adds lots of charm to the classy wooden brushes with synthetic bristles. 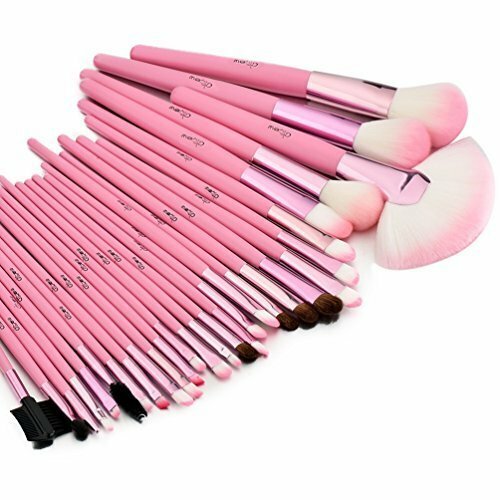 It contains 12 brushes ranging from foundation brush, eye shadow brush, eyeliner brush, mascara brush, lip brush, concealer brush and eyebrow brush. All the brushes are made up of wood and have soft and plush bristles which give an air-brushed effect. This set is available in four styles and the price is very moderate. 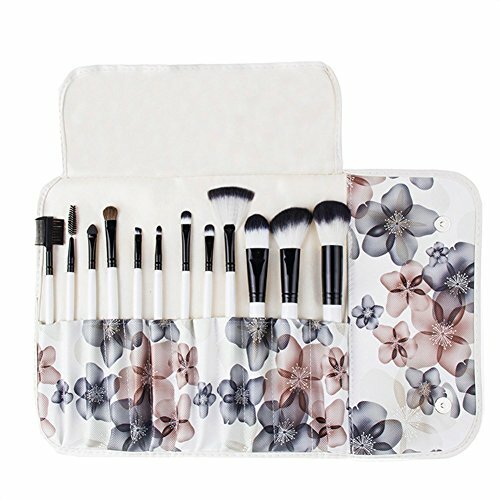 The flower case and the classy design of the brushes make this set a complete face brush set for makeup. The soft white bristles do not shed and work well for giving a natural look. Real Techniques is a well-known brand for quality makeup brushes which last for a very long time. This core collection brush set contains four brushes with a very handy brush case. The four brushes include a detailer brush, pointed foundation brush, buffing brush and contour brush. The neat orange and matte black color scheme makes the brushes easily identifiable. The black rubber grip allows easy handling. The brushes give a soft custom finish which makes the makeup stay longer. 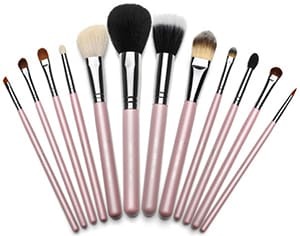 The brand is known for its quality and durable makeup brushes which are soft and do not shed. The four brushes make for a perfect face brush set and make the makeup last longer. Oval makeup brushes are taking the makeup world by a storm these days because of the flawless finish they provide. This brush set ten rose gold brushes which cover all face makeup applications. You can use these brushes for contouring, bronzing, highlighting, applying foundation, and eye makeup. The bristles are of very high quality and can be cleaned easily. The oval shape of the bristles allows perfect application and full coverage. The set comes in four colors and you can choose the one which you like. The price is very cheap. 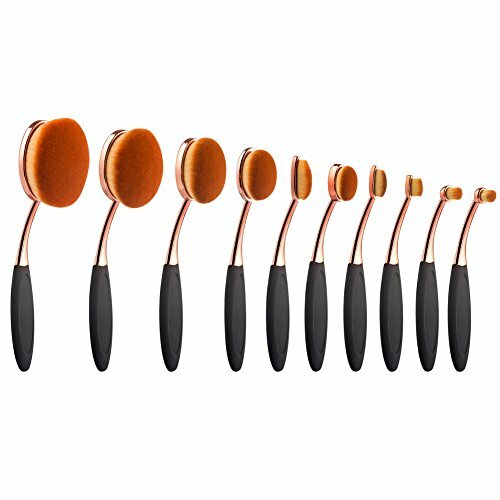 Oval brushes are the new favourite makeup tools as they give great coverage and allow you to reach difficult areas like the area around the nose and under eye. Another rose gold brush set, this beauty in rose gold color is one of the cheapest brush sets available in the market. 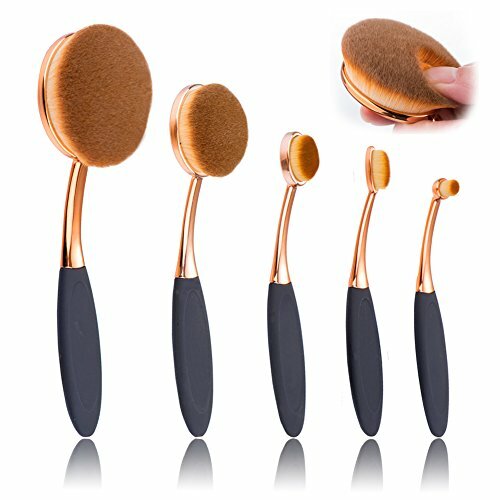 It consists of three oval brushes, one linear brush and one circle brush. The bristles are designed in a way that the product remains on the end on the bristles which controls product wastage. Another unique feature of this set is that the brushes have a mirror on the other side for your see how the makeup is looking. This feature makes this brush set great for travelling. The price of this brush set is very less as compared to other sets available in the market of the same or lesser quality. This 14-piece brush set contains five big kabuki brushes for face application and nine eye makeup brushes for creating different eye looks. The set is cruelty-free as the bristles are made up of synthetic fibres. The brushes come in a nice pink bag which keeps the bristles in place. The finish that these brushes give is amazing and the kabuki brushes give a flawless foundation application. The selection of brushes of this set is apt for the complete face and the kabuki brushes are very soft and perfect for powder application. This premium brush set from Beakey contains 10 premium quality brushes for makeup application plus one sponge blender with a silicone brush egg. 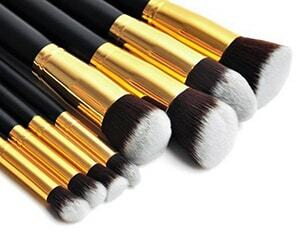 The brushes are of very high quality and allow perfect application of cream, powder and liquid makeup products. The silicone brush egg cleans the brushes effectively. The blender blends all different products together to give you a flawless look. 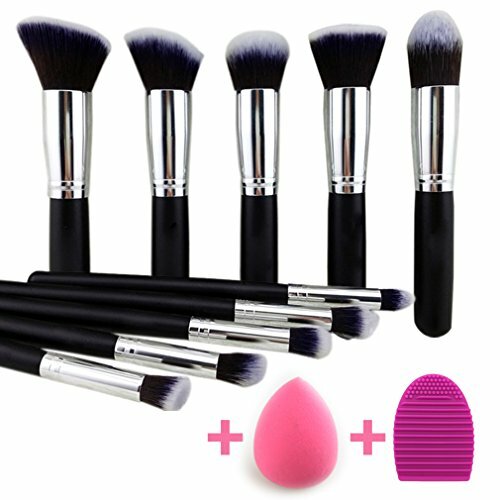 This set gives you complete collection of face brushes plus cleaning egg. The blender is one makeup tool you must use to get a flawless foundation application. 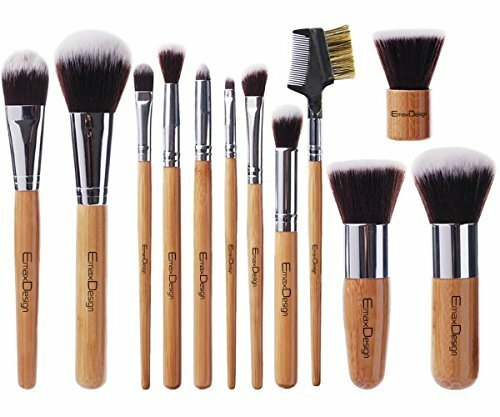 With 12 uniquely designed brushes for all makeup requirements, this set from EmaxDesign gives you high-quality brushes at a great price. The brushes are made from bamboo and the bristles are made of synthetic fibres which are soft on the skin. The brushes come in a carry pouch which makes it easy to travel with the set. It also comes with a printed sheet depicting the usage of each brush. The bristles of these brushes are very soft and do not shed at all. The big brushes offer complete coverage and give a natural look. This is the most important criteria to think upon before you go to buy makeup brushes for yourself. If you are a beginner, try and buy the essentials before going on to more complex brushes. Essential brushes include a foundation brush, powder brush for blush and bronzer, concealer brush, eyeliner brush, and lip brush. These brushes will be enough for you to apply base makeup with eye and lip makeup. If you are more of an eye makeup person, buying a set which focuses on eye makeup and its different techniques is a good option. The next important thing to consider is the material of bristles and handle of the brush. Choose whether you want to go for natural or synthetic bristles. Brushes made up of natural fibres can be expensive. Go for cruelty-free brands to help the environment. Brushes made with bamboo are usually preferred as they are easy to clean and environment-friendly. Bristles should be soft and densely-packed to avoid product wastage. 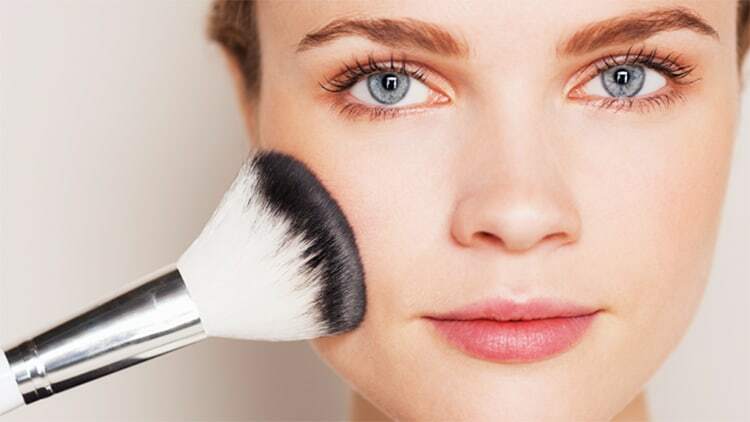 Powder brushes which are used to apply blush, bronzer and compact should be dome-shaped and lightly packed so that they pick up enough product. If you are on a budget, the price of the brushes becomes the deciding factor for buying or not buying the brushes you like. An average brush set can cost anywhere between 10 dollars to 70 dollars depending upon the number of brushes in the set and the quality. There are lots of amazing deals available online which will help you get amazing brush sets at a great price. Check the originality of the set before making a purchase to avoid buying fake products. Another important thing to keep in mind is that all your brushes are only as good as you clean them. Cleaning your brushes is a must if you want them to maintain their quality for a long period of time. The bristles should be easy to clean and dry and should not absorb much product. The handle of the brush should also not pick up product and dust as dirt can lead to many skin diseases. Buy a good quality brush cleanser and wash your brushes regularly for keeping them clean for your skin. Always use a makeup brush and not fingers for areas which can be reached with brush easily as this provides more coverage and less product wastage. Keep the brushes in the pouch provided with the brush set to keep them clean. The brush should be easy to handle and should have a comfortable grip. When you learn the use of different types of brushes and feel confident with your makeup skills, you can invest in some pro brushes which offer greater coverage and are made up of quality materials. Makeup needs patience and practice. Practice your brush skills to get the hang of the application. 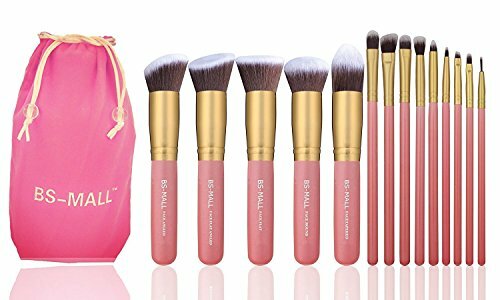 So these are some of the most popular cheap makeup brush sets which are great in terms of quality and price. This brush buying guide will help you to choose the ideal brush set for your makeup sessions. Do you love makeup? Which is your favourite brush set which gives an impeccable finish without costing you a bomb? I but a cheap makeup brush. Do you have some suggestion for cleaning a makeup brush? If your makeup brush is made of synthetic hair, you can just clean it with shampoo. But if you have a makeup brush which made of hair, so you have to clean and care the same way of your own hair. Here is my way to clean my own makeup brushes. 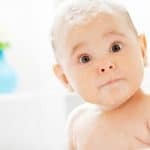 I first wash and squeeze out the water. After that, I flat them on a towel or tissue. But if you just leave them dry themselves, the wood may be damaged by the water. So, you’re losing long-life span of your brushes. I never think of cleaning brushes until they’re dirt now. How can I take care of them? You should find some gentle shampoos for your brushes. Next, you don’t make your brush full of soap and water. Then, you should hold your brushes with fur pointing down while washing. Don’t forget to re-shape them by running your fingers to smooth your brush. Finally, you lay the brush on a tissue paper to air dry. I use UNIMEIX Professional 12 Pcs. I really love it. Hi Angel. The cheap makeup brushes are cheap and last long. BEAKEY Makeup Brushes Set is my favorite.